Images of the supposed screen protector of the Pixel 3 devices have surfaced, throwing more light on what we should expect from the devices, including a notch and dual selfie cameras. Google's two generation of Pixels have been hailed as some of the best the Android OS has to offer. 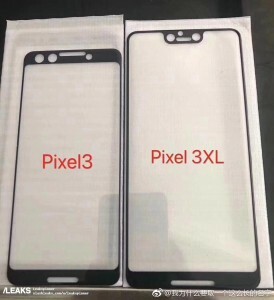 It's been about eight months since the launch of the current-gen Pixel 2 and Pixel 2 XL, though, which means that it's about time we got ready for leaks and rumors of the upcoming Pixel 3 devices. The first leak comes in the guise of live images of supposed display protectors. Of course, it's no much to go by but it does seem viable. Going by the images, one of the devices—the XL—will feature a notch. Notches have all but taken over the market since the launch of the iPhone X, and the fact that Android P supports them natively was always a clue that Google could implement the design in its upcoming devices. Both devices also appear to sport dual selfie cameras, which is a fairly uncommon feature in that segment of the market. There's also a slit at the bottom, likely for front-facing stereo speakers.